These engine kits, as its name DIY (Do It Yourself) shows, is not a complete engine. We deliver all components which are different from a STOCK ZENOAH ENGINE. 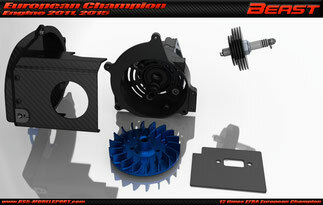 So you can build your own Beast engine, based on your FAVOURITE ZENOAH TUNER components. The 22810 DIY kit includes the following components: crankcase with bearing and seals, ignition housing, carbon covers, alloy starter cover, cylinder head heatsink and long spark plug, gaskets, ignition wiring, ventilator, selettra ignition system with starter nut and adapter for Zenoah crankshaft. This DIY kit does NOT include the following components: Zenoah crankshaft, Zenoah 2 bolt Cylinder (G230RC), Zenoah Piston (G230RC), Carburetor (Walbro 603), insulator and its gaskets. The 22811 DIY kit is a cost efficient option for you to have a spare engine. It includes the same components as the Beast engine DIY kit (22810), without the following components (these components can be taken from other engine during replacement): Ignition Coil, Spark plug, Cylinder heatsink, Engine covers. 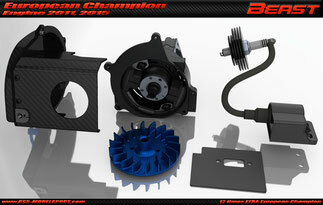 These engine kits, as its name DIY (Do It Yourself) shows, is not a complete engine. 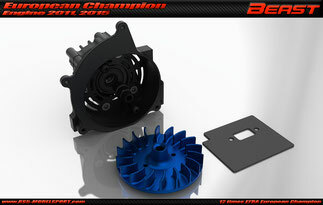 We deliver all components which are different from a Zenoah based MODELLSPORT ITALY M1 ENGINE. So you can build your own Beast engine, based on your EXISTING Modelsport M1 components. The 22820 DIY M1 kit includes the following components: crankcase with bearing and seals, ignition housing, carbon covers, alloy starter cover, cylinder head heatsink and long spark plug, gaskets, ignition wiring, ventilator, starter nut. This DIY M1 kit does NOT include the following components: Modellsport Italy M1 crankshaft, Zenoah 2 bolt Cylinder (G230RC), Zenoah Piston (G230RC), carburetor (Walbro 603), insulator and its gaskets, Modellsport Italy M1 ignition system (Selettra). The 22821 DIY M1 kit is a cost efficient option for you to have a spare engine. It includes the same components as the Beast engine DIY M1 kit (22820), without the following components (these components can be taken from other engine during replacement): Spark plug, Cylinder heatsink, Engine covers. This DIY M1 kit does NOT include the following components: Zenoah crankshaft, Zenoah 2 bolt Cylinder (G230RC), Zenoah Piston (G230RC), Carburetor (Walbro 603), insulator and its gaskets.